IT Asset Management is a leading consultant to help your business grow. IT Asset Cloud provides you with a number of ways to ensure discovery of all the assets in your network. You can manage software & hardware assets, ensure software license compliance and track purchase orders. Our cloud based software that helps you monitor and manage assets in your network from Planning phase to Disposal phase. MS Word Version Finder is a product of the IT Asset Management that makes the user to know the MS Word Program Version by which a specific word document created. Currently it supports the documents of MS Word Version 2007, 2010 and 2013. MS Word Version Finder is a product of the IT Asset Management that makes the user to know the MS Word Program Version by which a specific word document created. It mainly helps to the Recruiters, HR Executives and Users who intend to view the word document without change its internal formats and alignment. 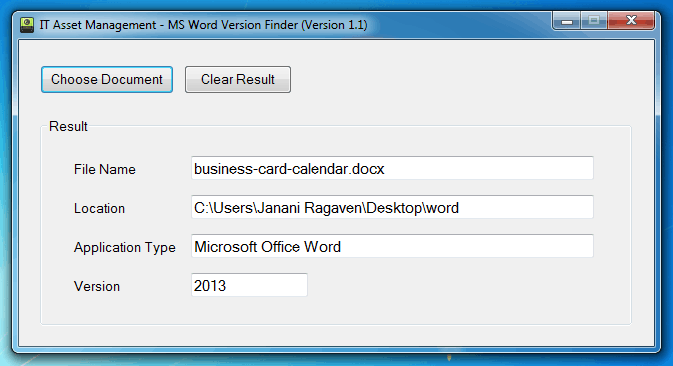 MS Word Version Finder gives the exact version information about MS Word Program in which a document created. So people directly open the document with the corresponding version that preserves the document structure. Currently it supports the documents of MS Word Version 2007, 2010 and 2013.